Star Wars: The Last Jedi comes out on special edition Blu-ray this week and we're still learning about the production of Rian Johnson's movie. In a new interview, motion capture maestro Andy Serkis was asked about how and when he learned the fate of Snoke in The Last Jedi. The actor revealed that he learned pretty early on and that he had to carry the Star Wars secret for quite a while, which was a challenge. Lucasfilm is highly secretive when working on Star Wars projects and The Last Jedi seems to have had the most security attached thus far. Andy Serkis echoed the comments of many who worked on The Last Jedi by stating that the script was securely placed on a tablet and that no paper versions were made. He also added that they had to hand the tablets back as soon as they were done reading. 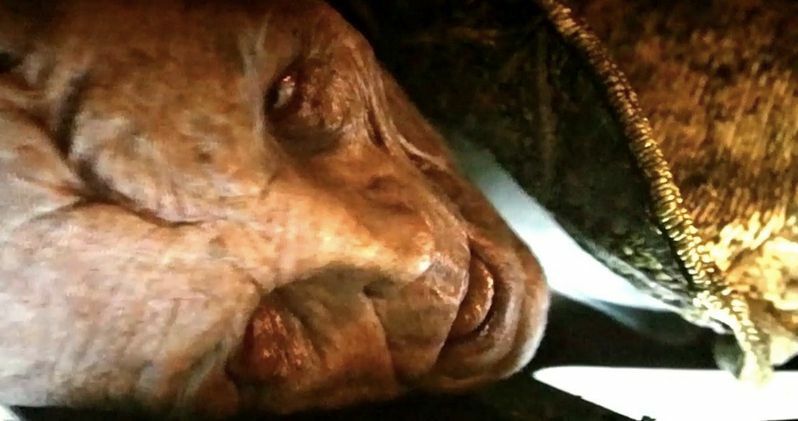 It's now that Serkis reveals that he learned of Snoke's fate in the movie on the very first day that he read the script. He had this to say. "I was taken to my trailer on the lot at Pinewood Studios, where I was to read the script for the first time on a tablet. We were never handed printed scripts, and had to hand back the tablet as soon as we were done. I was swiping through the story, and landed on this epic scene, where Snoke is goading Kylo Ren to kill Rey, to fulfill his destiny. It was riveting, the tension building with each line. I just couldn't work out where it was heading. And then as I swiped up... there it was. The end... not for Rey, not for Kylo Ren, but for the Supreme Leader... just gone." It seems like it took a second for the news to fully sink in for Andy Serkis after he finished the script for The Last Jedi. Though he was in shock after what he had just read, it was a different type of feeling that took over as Serkis walked out of the trailer on Pinewood Studios. Serkis realized that he was going to have to keep a huge secret for a lengthy period of time. He explains. "I walked out of the trailer in a state of semi-shock, feeling the weight of knowing I would have to mask a great secret for a very, very long time and that my brother, a massive Star Wars fan, was going to be heartbroken." One has to imagine that Mark Hamill felt the same way when he read the script for the very first time. It's been widely reported that the actor did not initially agree with the storyline that Rian Johnson had cooked up for Luke in The Last Jedi. Hamill's displeasure is even well documented in the Director and the Jedi documentary, which is a special feature on the digital and physical releases of the movie. Not only was Mark Hamill in shock, like Andy Serkis, but he also had to keep that dark secret for a long time. Fans who have been mourning the premature death of Supreme Leader Snoke have found some solace in the novelization of The Last Jedi. The book, which was written by Jason Fry with help from Rian Johnson, has some shed some light on Snoke's backstory. As for his return in Star Wars 9, Andy Serkis has his own theories, but he cannot make them public in case the character does actually come back. You can read the rest of the interview with Serkis over at USA Today.